The stitch is strong with this one. Over on Moogly (way back in 2013), some intrepid yarn twister compiled a list of free crochet patterns inspired by a galaxy far, far away. And with the new movie coming out, I thought you all could use a little distraction. I haven’t checked out all the links, but I have looked at the Ravelry ones, and indeed, they are free patterns. 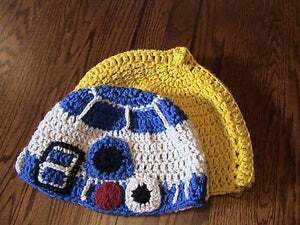 I’m not a huge Star Wars fan, as I haven’t seen any of the new films and the older ones I’ve seen, I was a little kid and fell asleep during them, but I know a couple of you are fans and might want to consider taking up crochet as a hobby. My personal favorite is the amigurumi AT-AT. There is something adorable about cuddling a transport vehicle that causes wide-spread death and destruction. New to crochet? No problem! Here is a user friendly video to show you how. Seriously, crochet is easy to pick up, fun to work and not bad to know if you need a few extra holiday presents to give out. Give it a shot! Just make sure you shoot first.